People. We are all, on this Earth, brothers and sisters. No race, religion, gender, class, or political group can be judged by the bad actions of a relative few. Even of they could, it's not the point. We were commanded by the Lord to "love thy neighbor as thyself" and when he said that, there was no fine print with exceptions to that commandment. You can't denigrate a whole race, or religion, or any group of people either by holding up their worst as an example of them all, by taking things out of context, by spreading rumors, by going on websites full of hate to find "facts" and then say you love your neighbor. 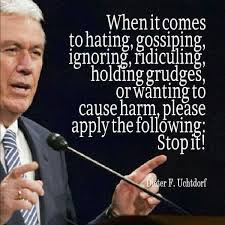 You can't spread discord and contention and think you are right with God, OK with the Savior. Those people you insult, are children of God. Literally. Imagine how you feel when someone has insulted your child. If you, being imperfect, love your child so much that your heart aches for them, imagine how much more pain YOUR GOD feels when you behave as if one, or some, or many, of HIS children, are trash or devils or whatever terrible label you want to use. The great deceiver, Satan, would have us live in fear of each other, in misunderstanding, in hate. He laughs at us when we believe him, that we have to build MORE walls around our countries, our communities, our hearts. He is a liar. Our Savior said things like love, pray for, do good to, those we call enemy. He said things like if ye are not one ye are not mine. Like turn the other cheek. What I say won't convince anyone to "Stop it," but I had to say it anyway.